I started making saddles in 1983. I was 18 then, and like most kids that age, I didn’t know what I wanted to do. My dad was always telling me to learn a trade. We were ranchers, and he knew that ranching didn’t always work out so it was a very good idea to have something to fall back on. There was an old saddle in the barn that had been gathering dust for years. It must have been made in the late 1800s. I can’t say why, but that saddle got my attention. I wanted to figure out how it was put together and what made it work, or for that matter what didn’t make it work. I rebuilt that saddle and was sure that I had come up with a super working saddle. It wasn't. It was too narrow and didn’t fit any of the horses we had on the ranch. That old saddle taught me how important the tree is. It is really the most important element. If the tree isn’t right, the saddle isn’t going to work for either the rider or the horse. I started out buying saddletrees and was pretty satisfied with those until I saw some of Dale Harwood's saddles. His saddles had a look that I couldn't find anywhere else. I saw that by building his own trees, he had total control over his process, something that I decided I wanted as well. We build our trees with Douglas Fir, a light, strong wood that grows here in the mountains. I have a close friend here in Lima who mills the wood for me. I store and allow to dry for about three years. When it's dry it's ready to be made into a saddletree. It's a slow process, but it gives me the quality control I want. I do ranch work in the summer and know what I want in a saddle. My customers are no different. I have to meet their standards, and it starts with the tree--the heart of the saddle. 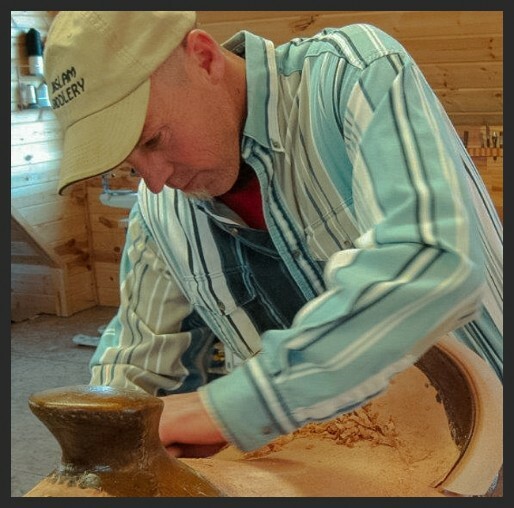 I like Jeff’s background because I think to be a good saddle maker a person should have some in-depth experience with horses. I don’t mean a saddle maker has to be a top-hand. But they need an understanding of horses—how they behave and what they need for comfort and security. Jeff has that so we had a meeting of the minds right from the beginning when we started working together in 2005. Jeff has been around horses all his life and started riding when he was about 5 years old. He’s been at it ever since. His horse experience includes horseshoeing school at Montana State University and working as a farrier for more than 17 years. He owns five horses that he, his wife, and two children use for packing and riding in the rough country around their home in Preston, Idaho. Jeff started working with leather when he was in grade school. Once you get the “bug” for this craft, it’s hard to stop. It was a natural progression for Jeff to seek more complicated leather projects, which eventually took him to saddle making. He started much the way I did, with some books and lots of curiosity, then hands on experience with good saddle makers. Jeff completed his first saddle in 1997. He worked as a farrier and a saddle maker for the next 7 years. 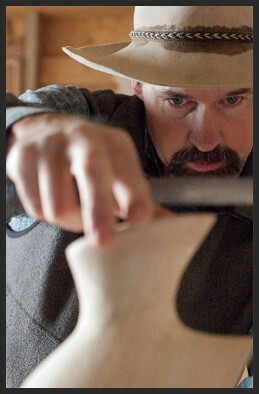 Then in 2004, he decided to become a full-time saddle maker.